I was recently at a scary locked room with a few of my friends, trying to escape as fast as possible. If you do not know what a locked room is, it is pretty much what it sounds like. You and your group are locked in a room and your goal is to escape within a certain time period, which is usually around sixty minutes. Using clues found around the room, you can unlock different locks and solve different puzzles to get further in the journey of getting out. As this was a horror-based one, it came to no surprise there would be jumpscares involved. I am not generally the best in scary situations, but I think I can generally hold my ground. However, two of my friends were a lot more easily frightened. What was strange was the fact that they were the only two people who ever saw the jump scares, while everyone else did not react. It was only after they screamed and shouted, we all turned and look at them with question marks. They would point at what they saw and say there was something there. When Cooler Master sent us a bunch of different keyboards, it seemed like all of them were tenkeyless ones. 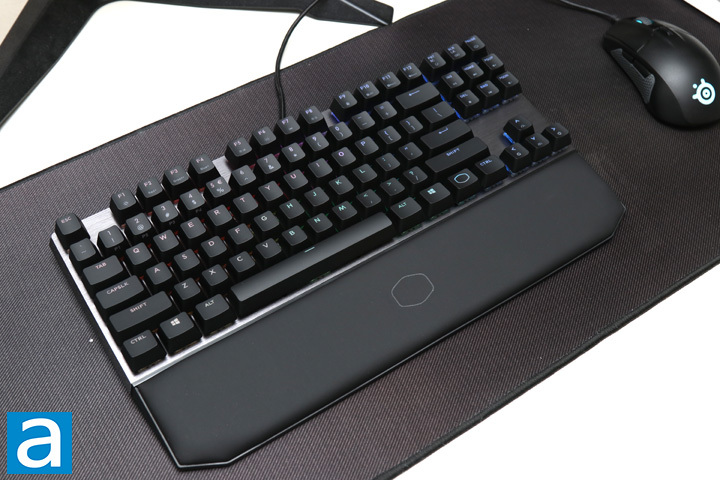 With so many in our offices, I think it is fair that Cooler Master wants to take the 80% keyboard market by storm and grab the attention from everyone else. While this launch hopefully will not scare you, is the Cooler Master MK730 a compelling keyboard and worth giving our attention to? Read on to find out! Today's review unit of the Cooler Master MK730 arrived from Cooler Master's offices in Chino, California. 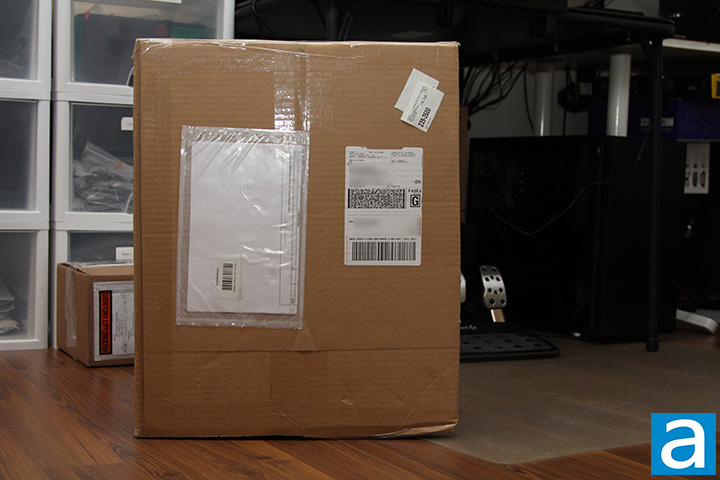 Traveling via FedEx and their standard ground service, this box arrived to our APH Networks offices in Calgary, Alberta. As you can see, the cardboard corrugated box is in relatively good condition, with no real dents or holes to be too concerned about. In addition to the MK730, we also received a whole ton of other peripherals, including the keyboards like the SK630, CK530, MK850, and mouse we looked at last week, the MM830. All of these are covered by our other editors including Jonathan Kwan and Ben Joubert. Taking a closer look at the Cooler Master MK730's retail box, you can see Cooler Master has generally kept this container in a similar look as you may have expected. Following Cooler Master's purple and black color scheme, the MK730 is displayed proudly in the middle with LEDs ablaze. 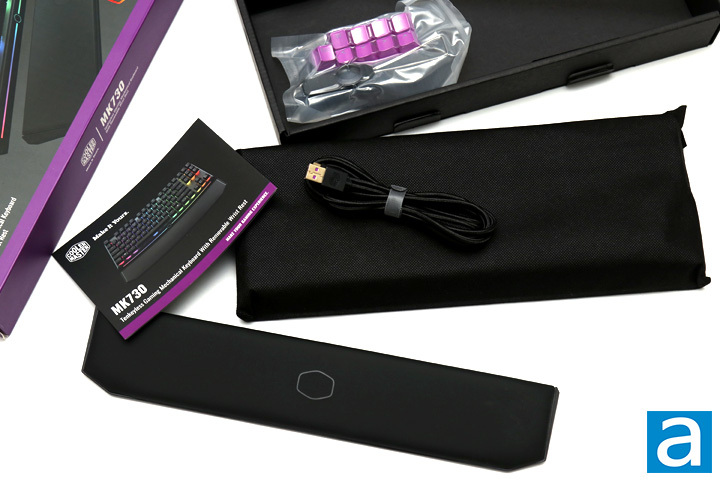 The product name and description of "Tenkeyless Gaming Mechanical Keyboard With Removable Wrist Rest" is shown on the bottom left side. It may not be a catchy tagline, but people should know what is inside from this. On the right side we see that there is RGB lights here, if the photo was not clear enough, and there are genuine Cherry MX mechanical switches. Our variant has the linear Cherry MX Red inside, though other flavors of switches are available with the MK730. Otherwise, around the side and back, we have some more features listed in various languages. Out of the box, we have a few things of interest. First of all, you will find the keyboard packaged in a mesh bag. It is not exactly the most durable of bags, but it does have a Velcro attached to hold the keyboard inside. On one side, we have a plastic sealed bag that holds removable keycaps, specifically for the WASD, directional, and Escape keys. These keycaps are thicker PBT keycaps made with the double injection process. In the bag, we also have a wire keycap puller, which is great to see. In a longer plastic bag, we have the wrist rest for the MK730. Finally, we also have a 1.8m braided USB Type-C cable, which is really great to see. A small quick start guide is also included to highlight some of the secondary functions, but we will see what that looks like later on. Just for your information, the MK730 comes with a standard two-year warranty, which seems to be an industry standard length. One thing I like about Cooler Master keyboards in general have been how minimal they look. Obviously, some may not love this, but I think this gives their keyboard a fresh look. 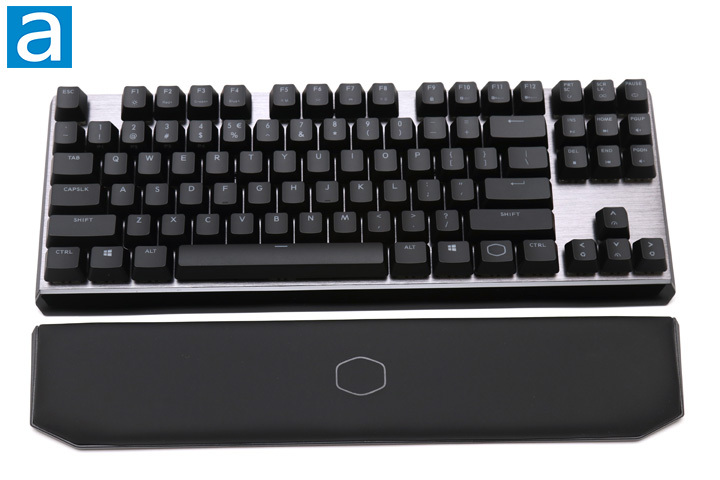 Cooler Master has kept this keyboard clean by only having the Cooler Master hexagon outline around on the Function key and in the wrist rest. As you can see, the keyboard follows a silver and black color palette, with a brushed aluminum backplate shining under the black key caps and wrist rest. At the front, we have a glossy black area too, which conceals the magnets to hold the wrist rest and some lighting, as we will see later on. Otherwise, you can see once again the MK730 uses an island-style design, with an exposed backplate and switches and keycaps placed above this backplate. This exposes the switch for better backlight spill. Overall, the MK730 is nothing new, especially since it is essentially a tenkeyless version of their full-sized MK750. However, I am glad to see they made this, especially as a person who loves these smaller keyboards. One feature I am quite glad we see with the Cooler Master MK730 is the wrist rest. While it is such a basic thing, many manufacturers have neglected this helpful addition. As for the one included with the MK730, it is made up of plastic, but the top is sealed over with a polyurethane leather and filled with foam for a comfortable palm rest. With a matte and grippy finish, it does not hold oily marks, which is a good thing. It protrudes out enough so you can actually rest your palms on it. The wrist rest connects via two magnets that keep the rest connected when it is left on a table. However, it is not locked in place and lifting up the keyboard will mean the wrist rest falls off almost immediately. As for measurements, the keyboard is approximately 358mm in width, 129mm in depth, and 39mm in height. These dimensions are about as expected for an 87-key keyboard, though it is a bit larger than the smallest footprint keyboard I have seen, the Cooler Master MasterKeys S. With the wrist rest attached, this adds an additional 65mm in depth. In terms of mass, this keyboard weighs 698g without the wrist rest, and 811g with. This is pretty light, even for a tenkeyless keyboard, but thankfully the keyboard holds up in terms of build quality. With the exposed aluminum wrist backplate but plastic shell, the keyboard still shows no signs of flex or creaking when twisted. The wrist rest is obviously more flexible with only a plastic body, but it should hold up in day to day usage. 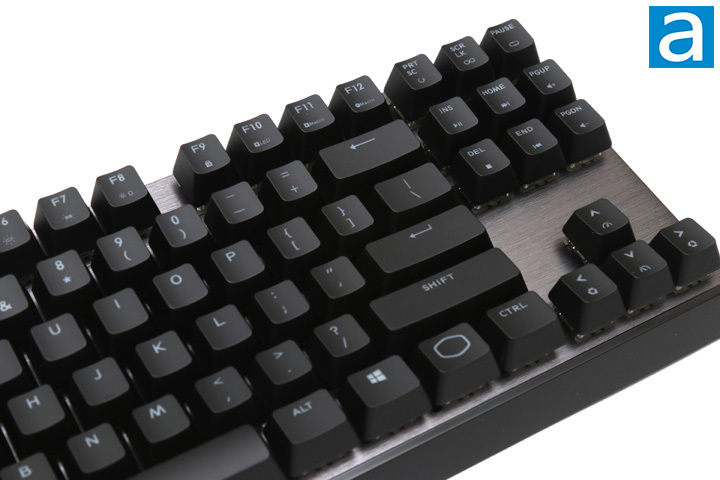 The Cooler Master MK730 arrived in a standard 87-key QWERTY ANSI layout. The overall layout looks exactly like any typical tenkeyless board, which means a regular keyboard minus a number pad. The bottom row is a standard layout, which means all of the keys besides the space bar are the same width. In addition to removing the number pad, Cooler Master also removed the indicator LEDs. These are now partially integrated into the lighting of the Caps Lock and Scroll Lock. If the lights are turned on, all of the lock keys will be turned on. When either lock is first pressed to activate them, it will stay lit up. However, when you press it again to deactivate it, the light will turn off for a few five seconds before it resumes the regular lighting. This behavior also varies based on the backlight patterns, but we will see all of these patterns later on. It would have been nice to see an indicator for Windows lock however. As for secondary functions, the Cooler Master MK730 have a lot of different ones for both lighting and keyboard functionality. These can all be activated by pressing the Fn key prior to pressing the secondary function key. I will cover the lighting ones later on, which are located from F1 to F8, as well as the arrow keys. F9 is used for locking the Windows key while F10 is for recording LED backlighting. From F11 to Pause, we can see some macro functionality. F11 and F12 are for recording and deleting macros, while Print Screen, Scroll Lock and Pause are for executing macros in a single, infinite, or on repeat. Underneath the aforementioned keys, we have the secondary media functions. Here we can find Play/Pause, Stop, Next, and Previous keys. In addition, we have keys for Volume Up and Volume Down, but curiously none for Mute. You can save many of these settings to four profiles, and each of them can be accessed via the 1 to 4 numbers. Finally, there are some unmarked ones, which are Escape, E, and R. Escape reverts the current profile to the default one, E resets all profiles to default, and R resets the current profile to default. Since these may not be used as much, it is completely fair to not see these be marked. As for key rollover, the Cooler Master MK730 offers NKRO over USB. 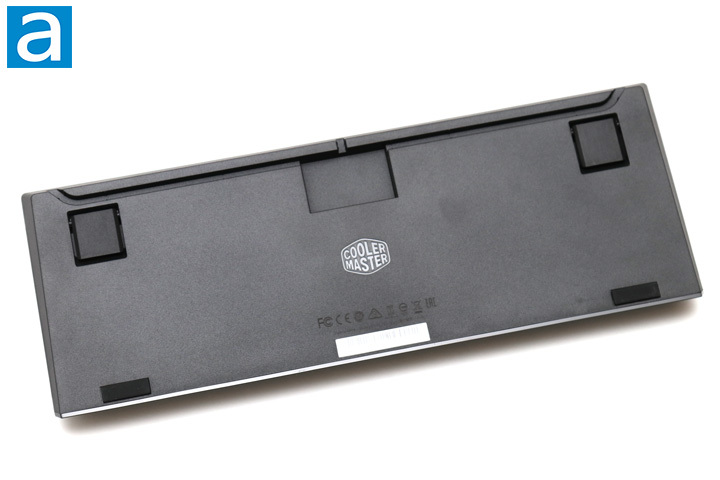 NKRO is abbreviated for n-key rollover, which refers to the number of keys independently scanned by the hardware. In essence, this fixes ghosting issues found in cheaper and/or laptop keyboards. While ghosting is a marketing term, there are cases where keyboards will not be able to recognize more than one keystroke at a time, causing for missed keys. This can be frustrating when you are playing games or even if you are just a very fast typist. On an aside, the original usage of ghosting in keyboards actually referred to a third key being registered when two other keys were pressed, which thankfully is not a problem with most modern keyboards. Before continuing on, one of the selling points of the Cooler Master MK730 is the mechanical key switches. There are three main types of keyboards in the market today. The cheapest but most common is the membrane keyboard, which is the easiest to make, but also has poor typing feel and response due to squishy keys. Next is a scissor switch keyboard. This can be thought of as an enhanced rubber dome with two extra interlocking plastic pieces connected to the key and the keyboard. This creates a better tactile response and typing experience in comparison to the aforementioned membrane. Mechanical keyboards, such as the MK730, cost the most, because each key switch is an independent part. These switches are generally composed of a base, stem, and spring, with varying degrees of tactile and audible feedback. 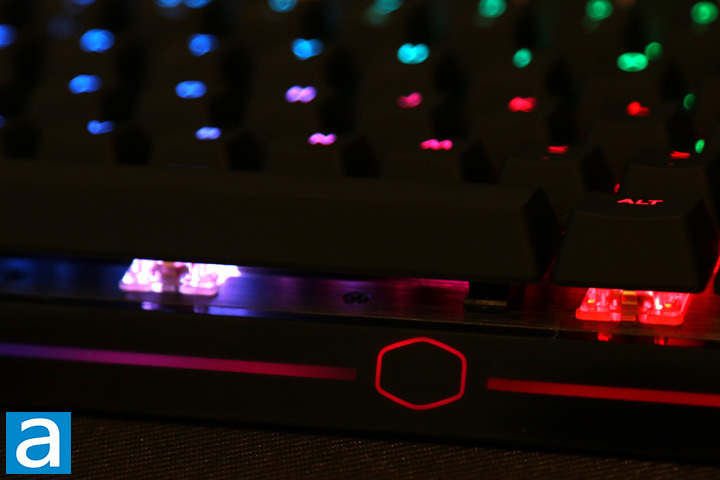 Our unit of the Cooler Master MK730 features Cherry MX Red switches. These linear switches are often favored by gamers, as they feature a quiet typing experience and a relatively low actuation force to trigger them. These are rated to last up to fifty million keystrokes. They have a 45g actuation force, a travel distance of 4mm, and actuation distance of 2mm. Otherwise, you can see there is a clear enclosure for each switch, allowing the RGB lighting to spill out. As for the keycaps that sit on top of these switches, these are standard ABS keycaps. While they are the more economical option of keycap materials, they are easily stained and can also fade easily. The font itself is laser etched, so it should not fade as easily as font that is printed on top. At the bottom of the Cooler Master MK730, we have nothing too surprising. As usual for some of their keyboards, you can see there are routing valleys for the included cable, letting you route the cable out of the middle or bias it towards the left or right side, depending on where you plug your keyboard in. The cable provided is a 1.8m USB Type-C to full-sized USB braided one, which is great to see. The cable is not the most flexible, but it should be okay since you are not moving your keyboard as much as other peripherals like a mouse or a pair of headphones. Otherwise, you can see there are the standard kick out feet at the top and rectangular rubbers on the bottom. The feet are covered in a rubber grip so it provides a non-slip bottom regardless if the feet are extended or not. While it is not pictured here, the wrist rest also has six spread out rubber grips to help with keeping the keyboard in place as well. Otherwise, there are no audio or USB passthrough ports at the back of this keyboard, which could be disappointing if you use these often. I have never touched them when they have been included, so it is not a deal breaker. After plugging this keyboard into my computer, I used the Cooler Master MK730 for over two weeks. As these are Cherry MX Red switches, they definitely had the same linear feel I would have expected. I have used these genuine Cherry switches before, and thankfully these deliver. The keystrokes are crisp and clean. It is consistent across all keys, even those with stabilizers. In gaming situations, the keystrokes are light and fast to press. As I used these switches right after testing the thinner but linear switches on the Tesoro Gram Spectrum TKL, I found the travel distance to actually be quite a bit more than expected, but I still think the genuine Cherry MX Red switches are perfectly fine for gaming. Obviously, switch preference will vary, and I would recommend users trying them before committing to a type. When it comes to lighting, there are quite a few ways to customize the lighting effects on the Cooler Master MK730. The clear housing on each switch allows the lighting to shine out and bounce off the bottom of the backplate. 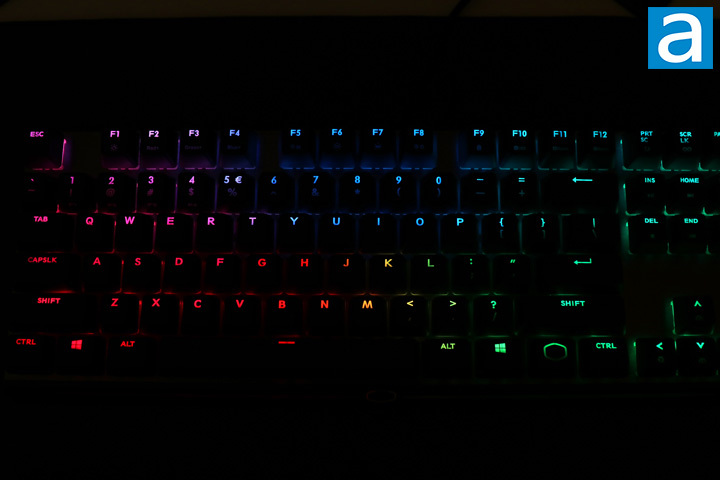 The lights shine through the keycaps, but the second row is not as well illuminated. This is because the light is located at the top of the key switch rather than the bottom. What I do like is the amount of customization, in both colors and effects, you can do without using the software. This is the same system Cooler Master has employed with their other keyboards and I really appreciate it. If you scroll down a bit further to the last photo, you can see Cooler Master has also kept the front lighting bar that lights up in sync with the rest of the keyboard. While it would have been nice to change this lighting area separately from the rest of the keyboard, I like the subtle way it glows and it makes for a really unique look. As we mentioned, there are secondary keys for adjusting all of these lights. F1 cycles between commonly used colors, while F2 to F4 are used to adjust individual red, green, and blue levels. This provides a total of ten levels of intensity for each channel, including being off, giving users a thousand different possibilities on the keyboard. One side effect is that there is no dedicated brightness level, since it is the same as varying each color level. Moving on, F5 is used to cycle through the different effects, which you enable through the software, as you will see soon enough. By default, there are a certain number of effects provided, but the software will let you unlock more. F7 and F8 allow you to change the colors for the foreground and background lighting. Finally, the arrow keys are where you can change the lighting effect direction or the speed of the effects. The last two sets of keys I mentioned have differing effects depending on the current lighting mode. If you still want more customization or macro recording, you can download Cooler Master's software. First, you should download Cooler Master Portal, which is 9MB in download size. It should be noted there are two versions of this, but they are not cross-compatible, so be sure to download the correct one. This really confused me, especially since I expected Cooler Master would try to make everything into one application. In total, the Cooler Master Software took up about 65MB of space on my computer after installation. The first tab is where you can see all of the LED settings and lighting effects. From this page, you can enable different effects to cycle through with the keyboard shortcut while also changing their colors and background effects. There are all sorts of different effects, whether they are reactive or non-reactive modes. We also have the snake mode make its appearance again. You can also combine multiple modes or make custom static ones. This really is a lot of different effects, which is pretty cool to see. 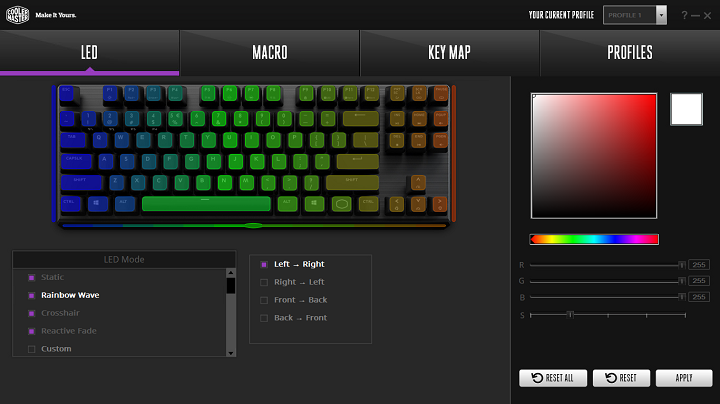 The second tab is about macros and it lets you create and assign them to keys. This lets you record both keyboard and mouse actions. You can then reassign every key, even the function key, on the keyboard. The third tab is about remapping keys. You can also disable certain keys if you want. Finally, the Profile tab is where you can manage all four profile settings and save them to your computer. Overall, the software works well on its own, and has no real oddities to its interface or experience. With the MK730, Cooler Master may not necessarily be making a big splash, especially this is essentially a tenkeyless version of a keyboard they already make, but in the same way I am quite pleased with the result we have. When compared with other 87-key keyboards, the Cooler Master MK730 compares favorably because it still keeps practically all the important features you would expect from a full-sized one. From the beginning, we have excellent build quality with its exposed aluminum backplate. Its magnetic wrist rest is comfortable with its pleather finish and foam interior. There are some plastic portions, but the keyboard is still very sturdy. Other features like the modern Type-C connection, additional PBT keycaps, and a wire keycap puller are all great to see. 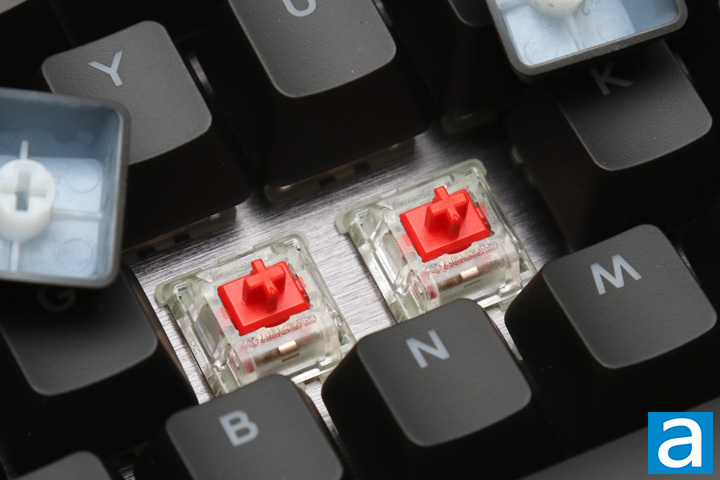 Cherry MX switches have always provided for a consistent experience and these red switches perform. RGB implementation has generally been great with Cooler Master, and thankfully it is no different with the MK730 and its many lighting options. Finally, its software works great for customizing both macros and lighting. The keyboard is not flawless however, with some possible improvements to be made. For one, I would have liked to see a full set of PBT keycaps included. I also would have liked to see a way for the Windows Lock to be indicated. With an MSRP of $120 USD, it is not the cheapest option. 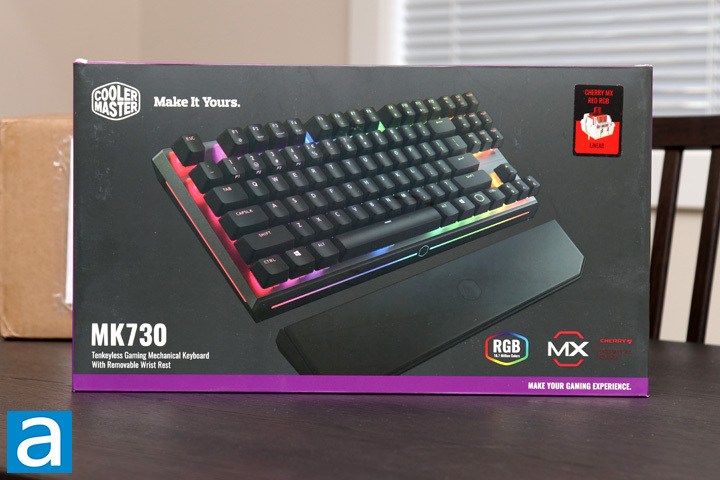 However, considering this is one of the most complete tenkeyless keyboards I have reviewed, Cooler Master has made the MK730 a great choice by offering almost everything you would want. Do you have any comments or questions about the Cooler Master MK730? Drop by our Forums. Registration is free, and it only takes a minute!